Pear Note for iPad is coming very soon. I can’t say exactly how soon, as Apple is in control of that. It has been submitted to Apple, and will be available for purchase on the App Store whenever they approve it. In the mean time you can learn more about what’s coming by looking at the new Pear Note for iPad page here on this site. Also, Pear Note for Mac 2.1 is now available. The main change in 2.1 is an updated file format that is compatible with Pear Note for iPad. 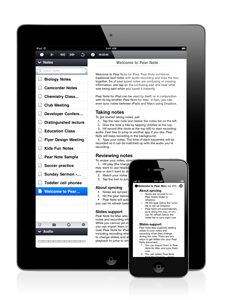 Pear Note for iPad can sync notes via Dropbox with other iPads or Macs running Pear Note. If you’d like to sync over old notes, you’ll have to open them with Pear Note for Mac 2.1 and re-save them. They’ll be updated to the new file format, making them readable in Pear Note for iPad. There’s another small but very important change in Pear Note 2.1. Pear Note and Lion did not get along as well as I had hoped, resulting in a bug there that could cause recordings to disappear. I apologize to any of you that lost recordings due to this, but it’s fixed in Pear Note 2.1. If you’ve upgraded to Lion, I recommend you update Pear Note for Mac to 2.1 immediately to avoid running into this.